Content filtering in schools has always been contentious since students and teachers first gained access to the World Wide Web and the Internet in the 1990s. Today in 2019, however, many people might be surprised that “draconian content filtering policies” (at least in the opinion of this author) are still in place in some schools. By “draconian,” I mean content filtering policies which excessively limit open access of information by students (and in many cases, also teachers) and which fail to meet a basic litmus test of “digital citizenship:” Providing ‘graduated” or differentiated content filtering for teachers, and for students depending on their age and developmental level. Specifically in this post, I want to address the reality that as of March 2019, some very large public school districts in both Texas and Oklahoma block ALL access to YouTube for ALL students accessing the Internet at school: High school, middle school, and elementary school students. In this post, I’ll make the case for why these policies are flawed and need to be changed, to support the literacy and digital citizenship goals which should be part of the mission of every educational institution in the United States today. Let’s begin with a strong assertion which indicts (on this topic) at least two very large public school districts with which I’m personally familiar in Oklahoma and Texas. I’m not going to name the school districts here, my goal in writing this post is not to throw those specific districts and district leaders “under the bus.” I DO, however, aspire to help change the content filtering policies in those school districts and others, however, which have not kept up with our times and are sorely in need of updates. I have (of course) incomplete information on why these web content filtering policies persist today, but suspect there are both political and technical / IT reasons for them. Both can and should be addressed. I wish I had comprehensive data on how many public and private U.S. schools block YouTube entirely for all students or for all students and teachers today, but I don’t. If you have data on that topic, please let me know. If you’re looking for a topic for your dissertation, perhaps this will give you a helpful suggestion. Take this idea and run with it. 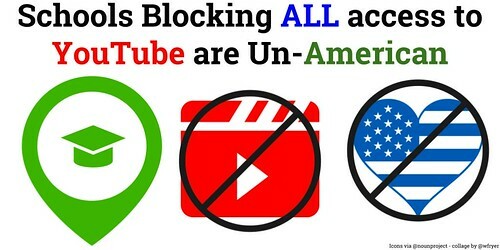 Schools blocking ALL access to YouTube are Un-American. Constitutional protections of freedom of expression in the United States go beyond protecting speech, however, and also provide for our rights to RECEIVE information. The First Amendment’s right to freedom of expression encompasses intellectual freedom, which includes an individual’s right to receive information on a wide range of topics from a variety of viewpoints. These two points are salient on the topic of filtering web content in schools, since they establish that school authorities in the United States do not have unlimited power to censor, ban, and prevent access to any books, content, websites, or ideas they deem inappropriate or immoral. Schools and school officials DO have important gatekeeping responsibilities when it comes to moderating print as well as digital materials accessed via the school library and the school’s Internet connection to the World-Wide Web, but those powers are NOT unlimited. My point here is that content filtering policies in U.S. schools should look VERY different from the national web filtering policies of authoritarian nations like China, Iran, North Korea, Turkey, Saudi Arabia, Qatar, Kuwait, Egypt, etc. These countries (and others) block all access to YouTube, or have historically blocked YouTube access. When content access policies in a U.S. school mirror those of countries like these, it’s time to take a careful look at why those policies were created in the first place and why they are maintained today. The “Unmasking the Digital Truth Project,” which I started ten years ago in 2009, sought to highlight the legal requirements of the federal eRate program for schools involving content filtering, as well as other legal mandates like COPPA and FERPA. These issues remain important and relevant today, especially as privacy concerns continue to grow more complex as greater amounts of personal information are shared online in our era of surveillance capitalism. (FERPAsherpa.org is one of my favorite resource sites on the topic of student privacy, btw.) While content filtering policies in some U.S. school districts have “progressed” in the past 10 years since ‘Unmasking the Digital Truth‘ launched, some have not. YouTube continues to be the second most popular website on our planet as of January 2019, after Google. Many adults today, especially those without teenage children in their home, may not realize how incredibly important YouTube has become and remains as a contemporary information source for students. This reality is fraught with both challenges as well as opportunities. One of my favorite things to say about this is, “Video is the pencil of the 21st century.” Among other things, this means we (as teachers) and our students should be creating and sharing content in video form as skillfully and frequently as past generations shared ideas with text. It also accepts that the dominance of video and YouTube is a REALITY today, which we need to address and embrace rather than ignore or deny. It is crazy that in the same Texas and Oklahoma high schools I’ve walked in where YouTube is completely blocked for students via WiFi, those same students can readily open their smartphones and access YouTube directly via their cell phone data plans. YouTube is one of the most important communication and information platforms for teenagers today in 2019, yet, some of our school leaders continue to support and defend policies which BLOCK all access to YouTube for those students on school networks. This is akin to a Egyptian official in the Library of Alexandria prohibiting any patrons from accessing any written texts, because “the only proper way to learn is to listen to an oral argument presented by a scholarly speaker.” That was the opinion of Socrates, according to Plato, but that idea was both wrong and ridiculous. New forms of media have shortcomings and present challenges, as Neil Postman and Marshall McLuhan remind us, but there is also an inevitability to the way media forms change and evolve. All teachers at your school should currently have open / unrestricted access to YouTube. As professionals, teachers can and should ‘serve as the filter’ for YouTube content they access and choose to share with students. This is both legal from an eRate and COPPA standpoint, and also the professionally appropriate policy for schools to adopt. At a minimum, all high school and middle school students at your school should have filtered access to YouTube. This can be a custom setting on your specific school firewall, or the Google/YouTube provided restricted mode. That setting does not have to be enabled on individual devices, YouTube restricted mode can be enabled network-wide for students. What are our current policies for blocking or allowing access to YouTube for teachers and students? If teacher access to YouTube is blocked, ask: When will our network hardware and/or school policies be updated to permit teacher access to YouTube? If high/middle school student access is entirely blocked, ask: When will our network hardware and/or school policies be updated to permit filtered high/middle school student access to YouTube? What is our district/school procedure for requesting that a YouTube channel or specific video is UNBLOCKED for student access on our network, and how can that process be further streamlined / made even faster? Without question, content filtering and student access to both content on the World Wide Web and digital devices (in both school and at home) is complex and filled with challenges. That access at school is not only (conditionally) protected by U.S. law, however, it also provides INCREDIBLE opportunities for learning and literacy both inside and outside the classroom of the 21st century. If the ideas I’ve shared in this post resonate with you, I’d love to hear from you. I’d also like to hear from folks who disagree with the ideas I’ve shared here. You can contact me directly on Twitter with a reply to @wfryer, write a comment below (which I’ll have to approve), or use my personal contact form. Of those options, I’m most likely to see your feedback and reply promptly if you engage with me on Twitter. Together, we need to provide both safe and empowering environments in our schools and homes for digital learning. There are MANY important conversations teachers, students, parents, grandparents, school administrators, and other stakeholders in the lives of our kids need to have when it comes to YouTube. With that in mind, we’ll be hosting a “Parent University” at our school on April 23rd titled, “Let’s Talk About YouTube.” We’ll also be hosting another “Parent University” session on April 11th titled, “Let’s Talk About Sexting.” Both of these events will be open to the public, but prior online registration (free) is required. Resources related to “digital citizenship” which we have and continue to share with our school community are available on DigCit.us. I don’t pretend to have all the answers on these issues, but I do know we need more opportunities for dialog and discussion which can empower us all with more knowledge and skills. What are your thoughts? Is YouTube access a big deal in schools? Should we be concerned about YouTube being blocked entirely in some schools from secondary student or teacher access?